Dropbox only sync one way on desktop or phone running Windows, Mac or Android operating system by Dropbox App together with cloud storage sync service – MultCloud. What Is Dropbox One Way Sync? According to Wikipedia, one-way sync refers to that files are added or revised in main cloud service will be reflected to a secondary account but vice versa is unavailable. As for Dropbox one-way sync, in theory, it can be one way sync from local device to Dropbox cloud drive storage or one way sync from Dropbox cloud to local. Yet, according to users’ needs, Dropbox one way synchronization usually means local to cloud sync. 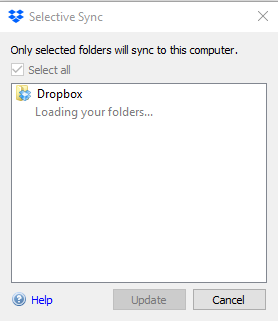 Except for the two kinds of syncs above, there is another Dropbox one way sync – sync from one Dropbox account to another. Why Need Dropbox One Way Synchronization? Make a copy of important files. Make it easier to share files with others. Cloud storage is cheaper than hard disks. There are much fewer users who want to one-way sync from cloud drive to local devices, but there are still some of them. For these people, they probably want to save files shared to them from cloud by their families, friends or colleagues to local; they lost their local copy of crucial data and just want to create a new one; they want to get access their cloud photos, videos, movies etc. on journey while there is no Internet available and some other reasons. Make a copy of source files. Share files to others by sync target files to his cloud. The owner is going to abandon the source cloud account and just transfer files to destination account. The destination cloud has larger quota to save data and the incoming files of the synced kinds. If you want to one-way sync between Dropbox drive and local computer, either from local to cloud or from cloud to local, you can make use of Dropbox App. Tips: Dropbox has webpage version, but this online Dropbox can only allow you to manually upload files from local to cloud storage or download from cloud drive to local storage. It can’t automatically sync files between local and cloud. To use Dropbox application, no matter your local device is, desktop, laptop, notebook, ipad (Dropbox one way sync Mac) or phone (Dropbox Android one way sync), you have to first of all download and install the App on the device. The following will take Dropbox desktop App for example. After successfully install Dropbox App on your computer, open it and it will automatically guide you to finish the settings of this software. Firstly, sign in your Dropbox account. 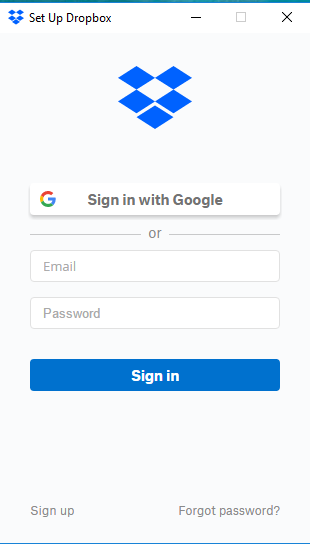 When successfully signed in, you can get started. 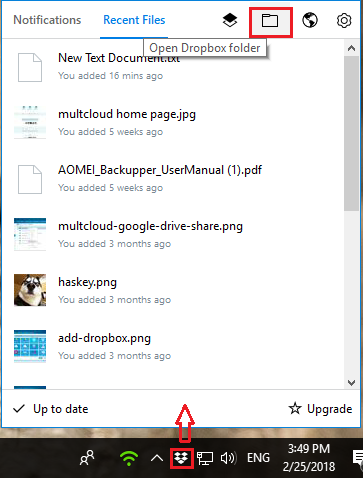 If you want to sync files from local to cloud, find the local location of Dropbox drive folder on your computer, create a local source folder (here is Folder 2017) and add the target files or folders to the local source folder. It will automatically sync the added items to Dropbox cloud. If you can’t remember where the local Dropbox folder is, just right-click the little icon of Dropbox App on right of the bottom taskbar and choose “Open Dropbox folder” (the folder icon). Dropbox App in default is a two-way sync App. To avoid new added or revised files be synced from cloud back to local, you’d better not to edit them in the folder 2017 in Dropbox. Right-click on its taskbar icon, move mouse to settings icon (the gear) and choose “Preferences”. 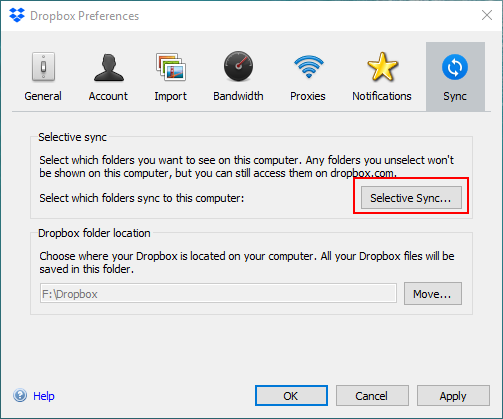 Next, in Dropbox Preferences window, move to Sync tab and select “Selective Sync”. In the pop-up window, select the folders you want to sync to your computer. Notes: Similarly, to avoid Dropbox App automatically reflect the changes from local back to cloud, you mustn’t edit the synced folders in local computer unless you want to make it a two-way synchronization. If you plan to sync files from one Dropbox drive account to another, you have to rely on another software called MultCloud for Dropbox App cannot help anymore. MultCloud is a web-based program, so you should first create an account of it before using it. Then, add your Dropbox accounts to its platform. 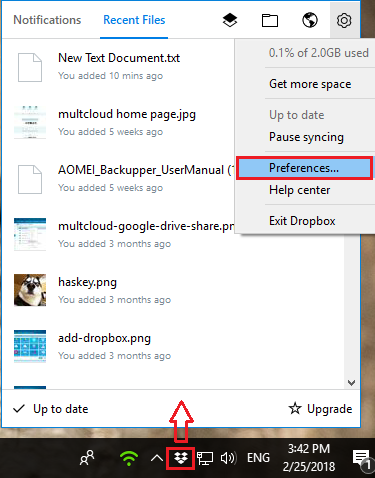 In its main window, move to Add Clouds tab and choose “Dropbox”. Follow the easy guidance to finish the task. Tips: MultCloud only allows you to add one account in one time, to add the extra account(s), just repeat the operation. Next, one-way sync target files from source account to destination one. In Cloud Sync tab, specify the source Dropbox and destination Dropbox. 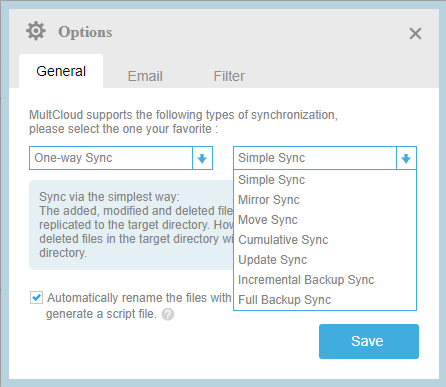 MultCloud provides 7 kinds of one-way sync for users to choose from General Options. They are Simple Sync, Mirror Sync, Move Sync, Cumulative Sync, Update Sync, Incremental Backup Sync as well as Full Backup Sync. 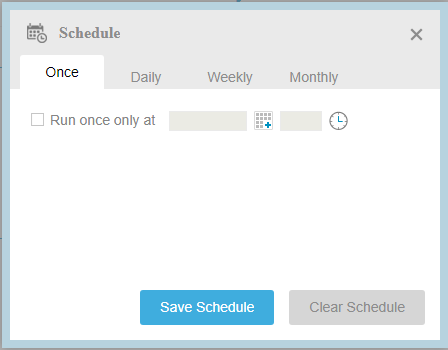 You can also set a schedule to do Dropbox one way sync daily, weekly or monthly. Besides one-way sync, MultCloud can also complete two-way sync. Just alter in General Options. Besides sync from one Dropbox to another, MultCloud can also sync from Dropbox to other cloud drives like Google Drive, Google Photos, OneDrive, Box, etc. In MultCloud platform, you can also manually upload or download files between local and cloud drives just like the web version of cloud drive. Finally, when all settings are done, click “Sync Now”. As you can figure it out that, for Dropbox one way sync between local and cloud, you are suggested to rely on Dropbox App; if you find it complex, then you can just manually upload/download using its web version. As for Dropbox only sync one way from one account to another, you should rely on MultCloud, an online multiple cloud drive storages manager. Besides sync files from one cloud to another, MultCloud also enables you transfer files among clouds.